Where is CHIP located and how do I get there by public transportation? Do you give hearing tests? CHIP has neither licensed audiologists nor facilities to conduct hearing tests. Hearing aids may be purchased from an acoustician (hearing aid provider). CHIP has a list of acousticians by area; you may choose one close to your home if you prefer. 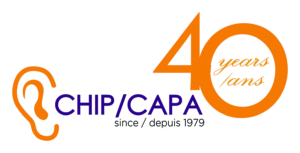 At the CHIP ALD (Assistive Listening Device) Resource Centre you may obtain general information on the different types and styles of assistive listening devices and their advantages and disadvantages. You should also consult with your audiologist and acoustician to determine which type is best for your particular hearing loss. Armed with this information you will be in a better position to obtain the best type and fit that suits you. You can obtain our membership form online under the Membership tab, or you can drop in or call the office to obtain a membership form. Are there any costs to attend seminars, workshops, and courses? Most seminars and workshops are free. There is a modest fee for some courses. See our Calendar of Events for details. How do I register for seminars, workshops, courses? How do I find out about dates and times? Click the Calendar Month View link on the main menu at the top of any page on the website. The information will be displayed in calendar format. Can I make an appointment to the ALD Resource Centre by email? ALD Forms can be found online at this link. I now have a deep understanding of the complexities of living with hearing impairment. I have become aware of how important it is for family members to know of the challenges their loved one is experiencing.